A prime innovator and major figure of 20th-century music, the American composer Elliott Carter was born 108 years ago today in New York City. G. Schirmer and Associated Music Publishers celebrate with a newly engraved set of parts for his Variations for Orchestra (1955). Its score was engraved in the 1990s with the composer's review, but until now performances used orchestral parts reproduced from hand-written masters. These new engravings were extracted from the digital files used to prepare the score, and additional cues were added to the parts. The Louisville Orchestra commissioned Variations for Orchestra and premiered it in 1956 under Robert Whitney's direction. 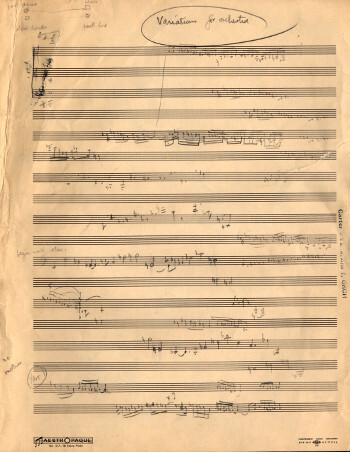 After the New York Philharnonic's performances timed to Carter's 80th birthday, John Rockwell of The New York Times observed, 'This 22-minute score was composed in 1955 and represents an early statement of the composer's mature concerns. Moving from a more conventional neo-Classical Americana, Mr. Carter has sought with his mature music to express the density and simultaneity of modern existence'.